The Disabled Veterans National Foundation (DVNF) recently sent a major shipment of its Health & Comfort supplies to a stand down event for homeless and low-income veterans in the Washington, DC area. This shipment is also our first opportunity to do our part to combat homelessness amongst our veterans, and events like these with so much collaborative support are crucial to those efforts. The goods were sent to the annual Winterhaven stand down event, which was originally scheduled for January 23rd but was pushed back to the 30th due to the heavy snowstorm. 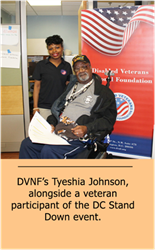 More than 800 veterans attended the event at the Washington, DC VA Medical Center, where they received medical care, case work, legal support, and food, in addition to ample clothing and care kits from DVNF’s shipment. Furthermore, several veterans in attendance also received $50 gift cards from the organization, just as DVNF’s way of thanking these men and women for their service to our nation. The initial estimated value of the Health & Comfort shipment to this event was around $200,000. The primary item in the shipment was warm clothing, which was specifically requested by the stand down’s administrator. DVNF staff were also on hand to help volunteer to pass out the items and support in any other way that was needed. They also helped to pass out the always-popular care kits to the veterans, which contain essential items like toiletries. Any of the DVNF items that were not distributed at the event will be used at the Washington VAMC’s 24/7 at-risk veterans center, which sees around 25 to 30 veterans each day.